The writing was in the stars. Milan were crumbling faster than the Roman Empire. After only 8 points in 7 games in the league, an inexcusable draw vs. Ajax in the Champions League, losing to both Ligue 2 side Caen and our very own Primavera in friendlies just this week, the boys had been ordered into ritiro to try to regroup. A couple of more big injuries causing us to lose both Balotelli and then Abbiati last minute, and the prospect of facing any team seemed formidable. But with Kaka’s first match back at the San Siro since 2009 and Gabriel’s debut in goal, it was either going to go very, very poorly, or by some unknown magic, it would end well. So for all of those reasons and more, Birsa’s singular goal victory became that much more sweet. And the win would go a long way to restore the faith, hope, and dreams of Milan fans everywhere. Let’s not get carried away. On any given day last season, this performance would have been considered poor. The passing was very poor, the play seemed disjointed at times, and the tackles were sloppy. But it was the drive and the hunger that kept us in the game and ultimately allowed the win. Maybe they just didn’t feed the boys in ritiro, I don’t know. But they were definitely hungry. So what they lacked in skill, they made up for in sheer determination. First, let’s talk Gabriel. After a great second half performance against Caen on Sunday, some fans were suggesting he replace Abbiati as our number one. I’m assuming they were younger than my children, because not even they would suggest such a thing. Gabriel is clearly very talented, but if you’ve watched him for Brazil or even with the Primavera, he is still young and inconsistent. His moments of brilliance should not be mistaken for World Class Keeper… at least not yet. And it must be remembered that his mistakes are undoubtedly going to be more frequent and facepalm-ish than a more established keeper. But still, Amelia was right to worry about his second spot. Tonight, he wasn’t overly tested, but did very, very well when called upon. He was very nervous, especially in the first half, so it’s good that Di Natale didn’t really introduce himself to him until the second half, about the 54th, I think. The young keeper settled in well enough and came up big in the 64th and 65th, amongst other times. 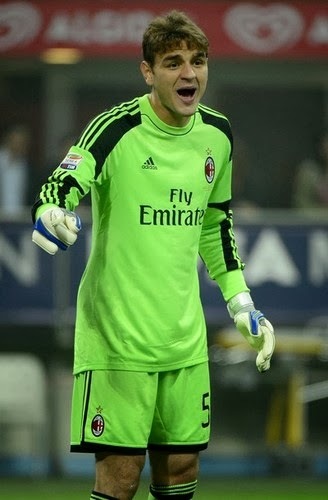 It is impossible to judge a keeper on one game, but I hope that he gets a chance to prove himself, he seems to be ready. The goal came in the 22nd, just 2 minutes after Pinzi had somehow avoided a red card for a nasty studs up challenge from behind into Birsa’s knees. Pinzi got the yellow, but Birsa did not get justice from the ref. So he took matters into his own hands, dribbled the ball halfway up the pitch, passed it to Robinho, who passed it right back for him to shoot it into the top right corner. Goal. 1-0 Milan. A lot of players played poorly, and I don’t know if I could honestly and fairly choose a man of the match. But it should be noted that Kaká came on and was incredibly motivated and looked much better than his initial appearance this season. On the flip side, one has to ask the question, “How is Matri still starting?” Because injuries is not enough of an answer. The man can’t hold the ball, he can’t pass the ball, he can’t receive the ball, and he certainly can’t shoot. Unless it is Allegri’s tactical plan to play a 4-3-1-1-placeholder, it is inexcusable. Also, I think his inability to score is wearing off on Niang, and I fear for his playing time because he simply cannot get the ball into the back of the net. In the list of positive appearances, Robinho worked very hard and created a lot of chances. He also got a yellow card for fighting with Allan in the 81st, but he doesn’t do that often. Unlike Muntari, who earned his in the 52nd for trying not to kill Pereyra (yet,) or Montolivo, who earned his obligatory yellow in the 25th. But back to the positives, Poli had a lot of great moments and almost-goals, even if he was also a little invisible at times. But I basically give everyone else a free card this time, the win was such a pleasant surprise. The Curva, on the other hand, does NOT get a free card from me. After having a stadium ban already suspended so fans could even be at the San Siro at all tonight, and with the issue of territorial discrimination already hanging in the balance, some fans sang “We Are Not Neo**itans.” So yeah, expect a stadium ban. I hope Galliani hunts each one of them down and charges them individually for whatever the ensuing fine is. Other than the poor behavior of some of the fans, the victory was so very sweet. A much needed victory for the faith and hopes and dreams of all of the fans, and the confidence of the entire team. Even more important on the brink of the Champions League match with Barcelona on Tuesday. One goal to bring a smile back to Milan fans, to give us three very precious points, and to teach the Milan players to believe in themselves again. Very sweet, indeed.